Kitten with ribbons. Another little ginger kitten, with the prettiest big blue/grey eyes peeking out of a pile of multi colored ribbons. There were so many interesting things for me about working this piece. 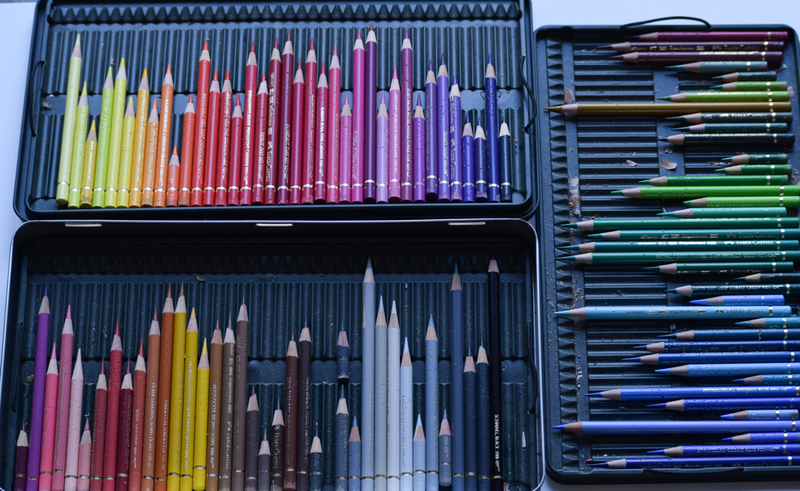 All those different coloured pencils l got to play with. All those different textures and of course my favourite part, the eyes! The Jewel Beetle. I wanted to draw a frog, but l stumbled upon this photo and had to draw it. Quite a challenge for me as it is very different to anything else that l have drawn and it was quite a time consuming piece, but definitely fun. Snowcapped Hummingbird. Yes, another hummingbird but l love them and l am still trying to get them right! This gorgeous little fella is worked on grey Stonehenge paper as l needed to get some contrast with his little snowy cap. Lilac Breasted Roller on Cherry Blossom. I don't think Lilac Breasted Rollers sit on Cherry blossom in real life. Every photo l could find they seem to be sitting on sticks! But l couldn't put this beautiful bird on a stick, so a little artistic license here and cherry blossom it is. I had wanted to draw one of these for a long time. A beautiful Bee Eater. Another little bird with gorgeous ruffled feathers. I love drawing ruffled feathers! This Eagle Owl is one of the most detailed pieces that l have worked on. I love creating bird art and this piece was a real challenge. I couldn't resist those big, haunting orange eyes staring out of the hole in the tree. The Eagle Owl is worked on Fabriano Artistico hot press paper and l used Caran D'Ache Supracolor and Luminance pencils and Faber Castell Polychromos. This cute little raccoon is a piece of wildlife art that I absolutely loved creating, he reminds me of all the cheeky little fellows we see when camping. He was worked in colored pencil (mainly Caran D'Ache Luminance for the fabulous pale colors in the range) on Fabriano Artistico hot press paper and measures 14"x12". This fabulous shot of a beautiful pink flamingo was so amazing, l loved it instantly and had such a lot of fun working it. This Spotted Eagle Owl was another piece of bird art worked in Faber Castell Polychromos, Caran D'Ache Luminance and Caran D'Ache Supracolor pencils on Stonehenge paper. How could I resist this cute little face? I thought it was high time that I included some dog art on my artwork page, so here he is. This little Yorkie was worked mainly with Caran D'Ache Luminance pencils, with Caran D'Ache Supracolor and Faber Castell Polychromos for the fine detail. I worked on a stone colored paper. This elegant peacock was a real labour of love and one of the most time consuming pieces that l have worked on. But l love bird art and had wanted to draw a peacock for a long while, so here it is. Great Blue Heron. I love bird art as you know, and I have wanted to draw a Great Blue Heron for a long time. So when I saw the beautiful reference photo by the amazing @peatonford on Instagram, I was just thrilled when she gave me her kind permission to use it. I loved the angle of this shot and the way that the feathers swirl around the body. I was so happy to be able to create this piece. It is worked as ever with my beloved Faber Castell Polychromos and Caran D'Ache Luminance and Supracolor pencils on Stonehenge paper. The Secretary Bird. Wow! What an unusual and striking bird. Drawn as always to bird pictures, I had to create another piece of bird art when I found the fabulous reference photo. This is a large piece, 15x10inches and has been worked using Faber Castell Polychromos, Caran D'Ache Luminance and Caran D'Ache Supracolor, colored pencils. I have worked this piece on Fabriano Artistico hot press paper. Ah! Cat art! I love cats. And I really loved this cats eyes and that intense expression. This tabby cat was worked in coloured pencil on Stonehenge paper and measures 14"x8". Another piece of beautiful bird art. I seem to be overwhelmingly drawn to birds. This black swan artwork was worked in coloured pencil on Fabriano Artistico hot press paper and measures 15"X11".